Downtown is only 20-30 mins walk from here, and most of the shops are closer. 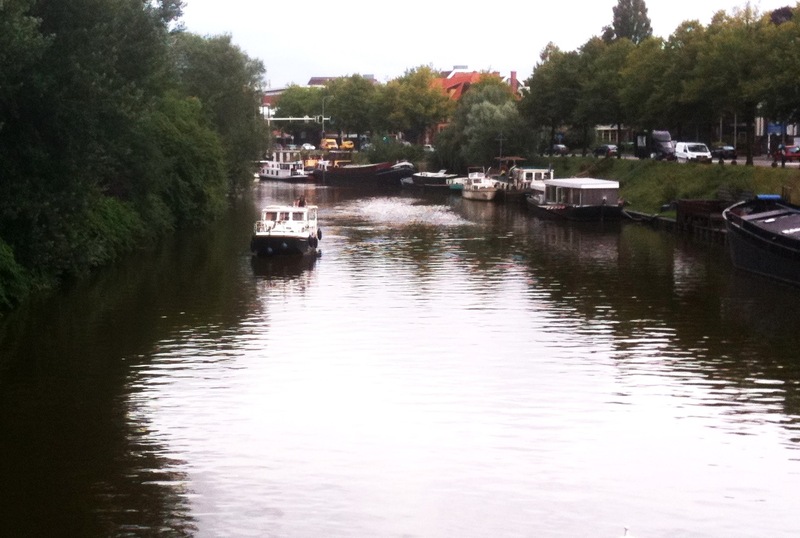 Of course, there are canals. With boats on them. One of them obliged me by barging toward me, allowing me to take the obligatory photo. Yay, thanks, boatguy! Ivo came for a visit and we went for a walk to wander around downtown and have dinner. 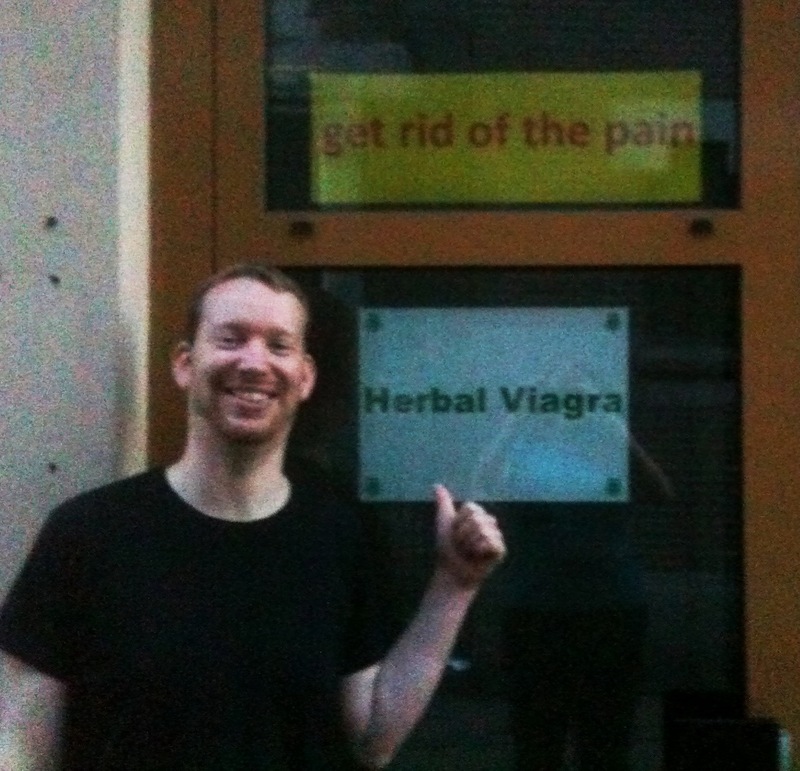 Spam is never far away from our thoughts, and we saw this sign and cracked up. 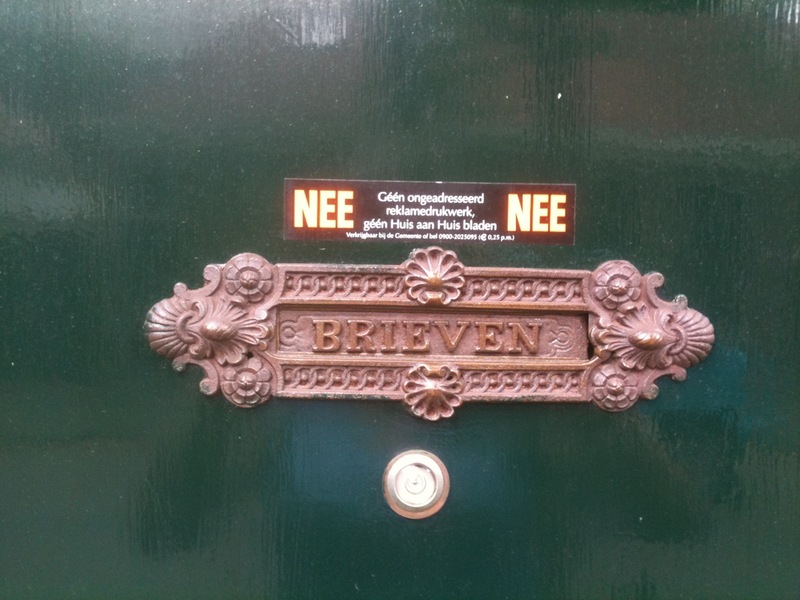 This lovely country provides a method of opting out of snail mail spam which I found both wonderfully amusing and very practical. There are two options. The first opts you out of advertising and local papers. The second disallows advertising but welcomes local papers. It’s Pledge Week here and the fraternities are at full throttle, throwing parties that last until 6AM.There’s a lovely old church downtown – of course! 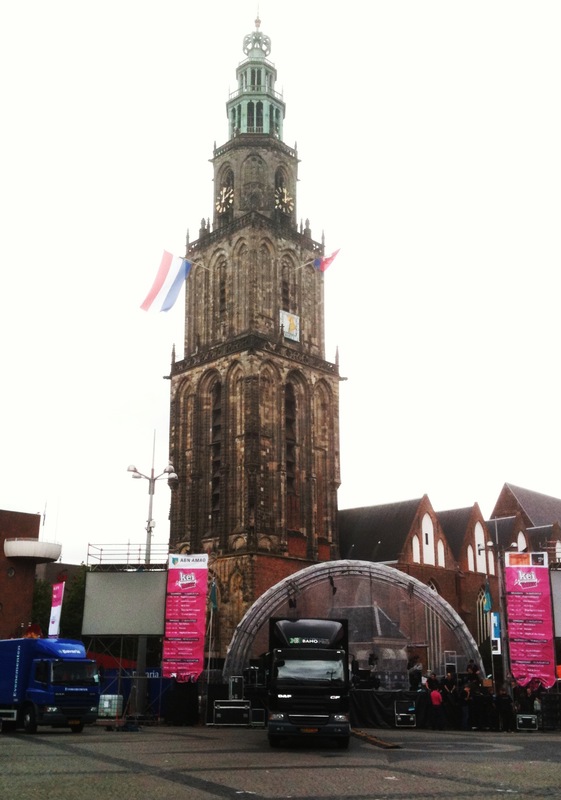 – and I was entertained by the contrast of the ancient church tower with the very modern sound stage being set up in front of it. We had dinner at a restaurant that took part in a “Survivor” type contest: over the course of ten weeks, one was voted off the island every week. 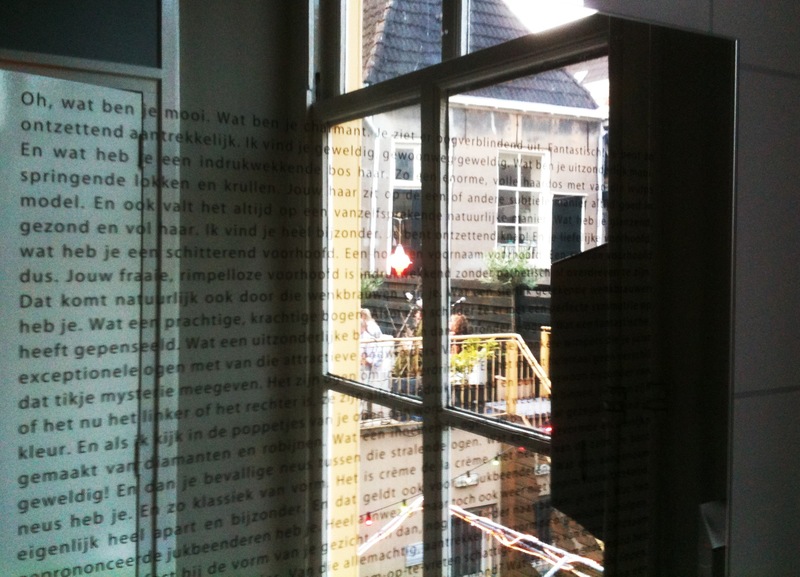 This one – Bij Jansen – made it to #2. The decor is very eclectic, the food is excellent and though the service left a little to be desired (our second round of beers arrived after we had entirely finished eating), we had an excellent meal. If you go there, try the lamb. I noticed a couple of details that made me grin. One was the folded red blankets over the backs of the chairs on the patio where people could dine al fresco – and a couple women using them! In AUGUST! The other was in the ladies’ room. An Ode To Women printed on the restroom mirror, how lovely, and the money shot of the evening. We walked home by way of the train station and along the tracks I saw another thing that made me laugh right out loud and be delighted to live here. That yellow circle is where people are allowed to smoke. 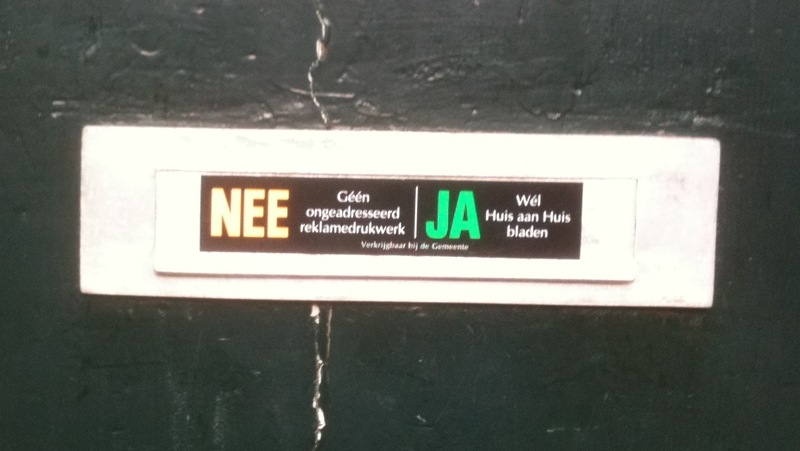 Otherwise: NEE! 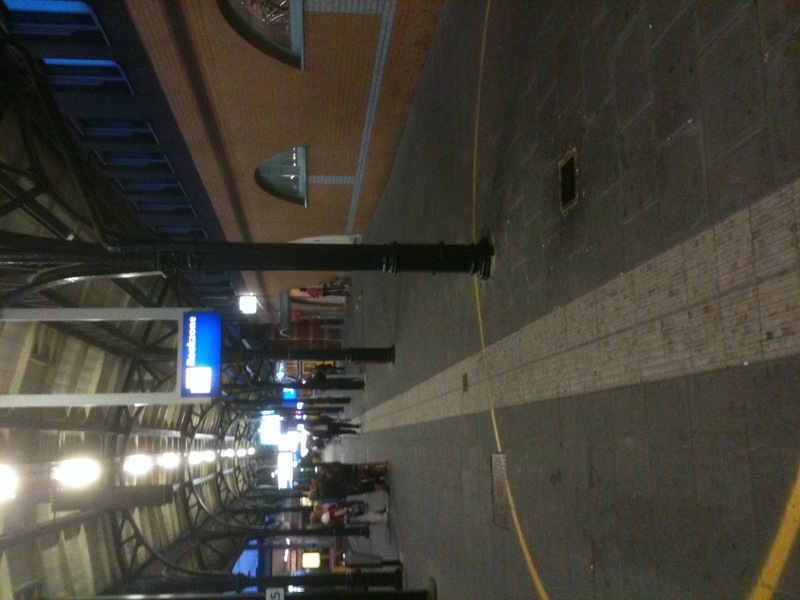 That white line, by the way, is the blindenpad which safely leads the blind down the tracks and avoids all obstacles. 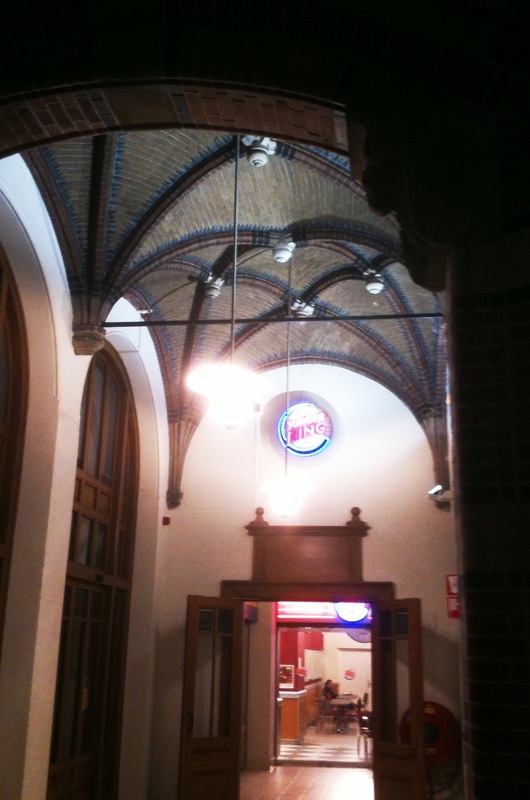 I leave you with a juxtaposition of horrible modern and gorgeous antiquity: shame on you, Burger King. That neon sign under the gorgeous vaulted brickwork ceiling is a blasphemy and should not be permitted. If I were Queen, I would not allow it! This entry was posted on August 16, 2010 by Coyote. It was filed under observations, photography . Fast food in general is a blasphemy and should not be permitted.